My friend and I were feeling super cool yesterday when we had girls’ night at The Spice Table in Downtown L.A.–on a school night no less! 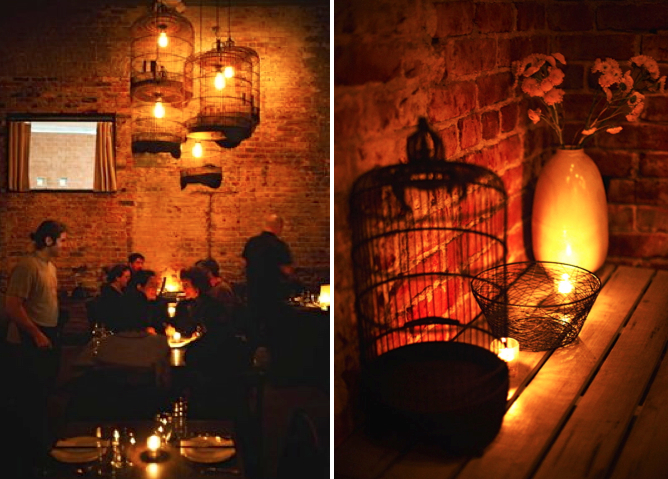 Dark and low lit, this gorgeous eatery seduces the eyes then surprises you by lowering the boom on your taste buds. Located in an industrial building in Little Tokyo, it has the makings of a happenin’ NYC spot with soaring ceilings, exposed brick walls and metal birdcages re-purposed into pendant lights with Einstein bulbs. I’m always skeptical of ethnic food in a beautiful venue mostly because I almost always walk away disappointed and bee-lining it for the nearest Sam Woo, taco truck or Pa Ord. The Spice Table was going to make me eat my words–along with 4 dishes none short of spectacular. The menu consists of small shareable plates and larger entrees. Seizing the opportunity since our better halves aren’t fans of fish sauce, we opted for the starter among starters–the fried cauliflower with spicy fish sauce ($9). How could something so unassuming be so mouth watering tasty? I’m actually salivating remembering this as I type. Spiced with jalapenos, these golden fritters could easily replace the ubiquitous basket of fries or tortilla chips. The fish sauce packed an extra zinger of diced Thai chili that I could have easily had a gravy boat’s worth. 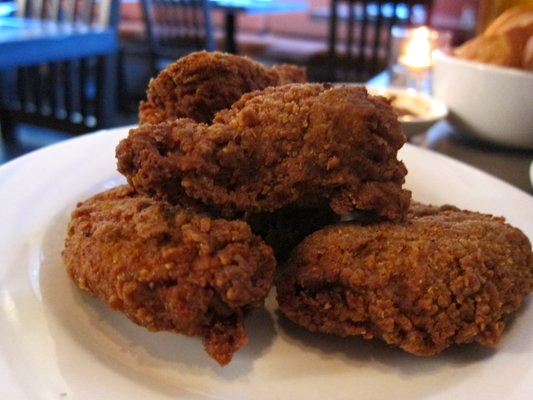 Next came the curry fried chicken ($14). I could taste that the chicken had been brined because everything below the crunchy, tasty skin was supple, moist and flavorful. 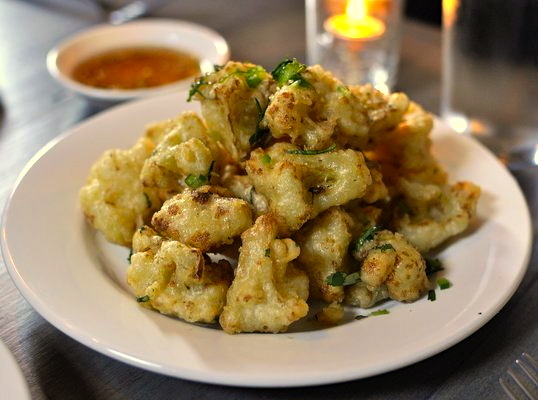 Paired with the crispy cauliflower, it was the Singaporean version of the all-American comfort dish. 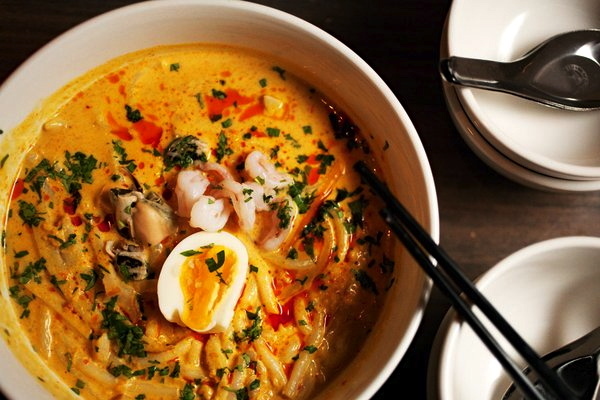 Soon we were at what I thought would be the main event: the Laksa ($16). Arriving in a bowl built for 2, the dish consisted of rice noodles, laksa leaf, spicy coconut gravy and slivers of fish cake and shrimp. Similar to a lobster bisque in consistency and flavor, the broth was thick and decadent with little pools of chili oil. It was then that we realized that we never got our Kaya toast appetizer. 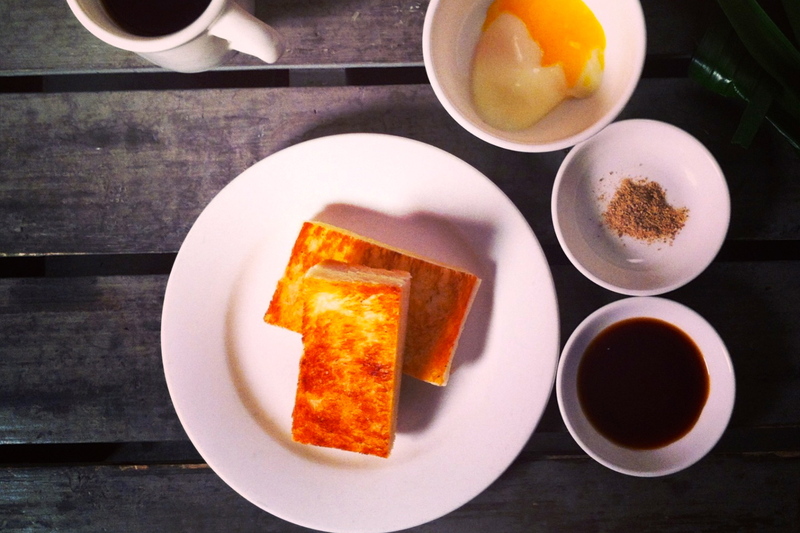 If there was ever a dish I could probably eat everyday, it would be the Kaya toast ($8). It arrived with a soft steamed egg, soy sauce and white pepper. “I heard this is a typical breakfast dish,” said my friend as the server mixed all the ingredients with a quick, frenzied whisk. Seizing the doughy, coconut jam smeared grilled toast, I dunked it in the soya-pepper-egg, took a bite, closed my eyes and looked to the heavens. I think I even heard a strumming harp in the distance. Five seconds later, she pulled a repeat performance.